Attendees wore white as they gathered for an evening of networking, entertainment and food and drink. Buyers gathered at the Cucumber Bar at Sea Containers event space last week for an evening with Robinson, the international hotel group. The evening was attended by 60 event planners and 60 TUI Leisure agents who enjoyed magnificent views over London and the Thames from the 13th floor of the building. One to one meetings with the individual hotels were held, giving buyers an opportunity to learn more about each resort and the Robinson concept. Each hotel has a white party theme and this was brought to the event. There was ample opportunity to network, along with food and drinks, and live entertainment giving the clients a feel of the Robinson culture and hospitality. 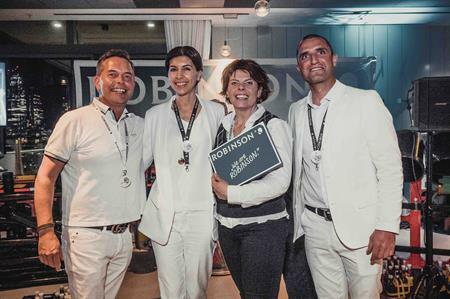 Kai Schömann, owner of hotel republic ltd, which organised the event, said: "This event was a great opportunity to re-emphasise the Robinson brand and concept to our UK event planners. "We were delighted with the attendance, which included the likes of BCD Meeting & Events, Banks Sadler, Venue & Destinations Solution, Image Events, Pac Conference & Event Management, Line Up, Ball Associates and many more."